Meet the stars and celebrities of yesteryear and today with admission to the world-famous Grévin Museum in Montreal. 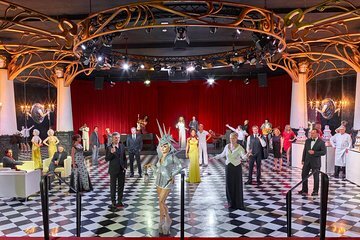 With themed exhibits and over 120 models, there’s something for everyone — from celebrities and rock stars to athletes and world leaders. There’s Michael Jackson, Justin Bieber, Barack Obama, Albert Einstein and many more. See those who have made their mark on Canadian history, like hockey legend Jean Beliveau, singer Robert Charlebois, astronaut Julie Payette and actress/singer Céline Dion. The list goes on. The Grévin Museum has become one of Montreal’s most popular attractions. When in Montreal, be sure to visit the world famous Grévin Museum, with special themed exhibits of the biggest stars — from celebrities and rock stars to athletes, world leaders and many more. Meet artists whose talents have made an impact on both sides of the Atlantic, like Ginette Reno, Marie Mai, the legendary Charles Aznavour and many more. See hockey legends, both past and present, like Mario Lemieux and Sydney Crosby. Join John Lennon, Yoko Ono, Steve Jobs and others at the Grévin Hotel. Travel through time, from the 16th to the 18th centuries, with French navigator Jacques Cartier. Check out the biggest stars — Brad Pitt and Angelina Jolie, Al Pacino and Robert De Niro, Michael Jackson and Elvis Presley — even an all-star band featuring Ray Charles, Louis Armstrong and Céline Dion. There’s also Charlie Chaplin, the Little Prince, Justin Bieber, Naomi Campbell, Marie St-Pierre, Coco Chanel and many more. Also, visit the Hall of Wonder and watch as nature, forests and butterflies transform in response to movement in a mesmerizing, interactive interactive environment. Finally, explore the Grévin workshops to see how wax figures are made. Participate in a virtual wax figure-making workshop — and even make a virtual wax figure selfie. There is something for everyone at the Grévin Museum in Montreal. Enjoyed the experience. The Intro film was redundant but once you got in, it wa cool. Really enjoyed making a wax replica of my hand. Nice selection of wax figures, including sports and movie celebrities, and iconic figures. Definitely worth a visit! Great service and value for money. Surprisingly lots of fun. Went on a Friday midday, it was not crowded at all. We enjoyed the props provided for photo taking but wish there had been more of them! Once again, pleasantly surprised! Passeio bem legal! Dentro de shopping. Facil acesso! I've never been to a wax museum before, so at first it was rather creepy, because the figures are so life like. After a while I got used to it, and I would go back again. Good if you have a few hours spare.